Time constraints have imposed an undesirable limitation to this history talk. I will therefore give emphasis, and not in a detailed analysis, the pre Hispanic history of Corozal and some contemporary history that should take us to the Caste War of Yucatan. So I humbly ask you to join me in this long journey. We are making history today. It is not a coincidence that the beginning of this 21st Century almost seems parallel to the Maya Baktun 13 which dawned on us on Dec. 21st 2012. And indeed we made history that day when we gathered here at this very sacred temple to celebrate the new Maya sun and the almost 5000 years of continued human occupation of Chactemal/Corozal. Today we make history again and I ask you to think with reverence that similarly hundreds if not thousands of our ancestors were congregating here on these same sacred grounds in the past. This temple is therefore testament to the fact that the history of Chactemal/Corozal does not begin with the arrival of the Spanish or British to our shores nor with the Caste War of Yucatan when thousands of Mayas and Yucatecos crossed the Rio Hondo (NOH UCUM) to return to their homeland but only to find it occupied by the British. The history of Corozal begins about 5000 years ago when the Paleo/Archaic Maya moved away from a nomadic unstable way of life to become sedentary through the creation of new technology to better control a not so friendly tropical environment. Hence they set the favorable conditions for the development of the Pre Classic Maya. The Pre Classic period was a crucial period of transformation which lasted from Backtun 1 to Backtun 7 from approximately 2800 BC to 300AD. This was the longest period of more technological advances in temple building, stale craft, Cosmo vision and in agriculture when the mixtamalization process and surplus production excelled. The foundation had neen set for the glorious classic period which flourished more with the Mayas of the central lowlands i.e. the late period of Baktun 7 and Baktun 8 or from 300 AD to 900 AD. The classic period of the Chactemal/Corozal Maya however did not happen until the post classic period, i.e., from 900 AD to 1511. The late period of Baktun 9 and Baktun 10, and 1511 is important because it is when the Spanish arrived at Chactemal/Corozal. Then what factors contributed to this continued prosperity of the Chactemal/Corozal maya with their apogee happening at a different period? What made then prosper when their brothers and sisters in the Central lowlands were abandoning their temples? E.g. Ox Witz Ha (Caracol) Tikal, Naranjo etc. For instance the Mayas at Cerros across the Corozal Bay had been socially and economically connected to the Chactemal/Corozal Maya but by 200 AD the temple had been abandoned. One factor stands out and that is trade and commerce, but the very factor that propelled the Chactemal/Corozal Maya to continued prosperity, contributed tot the abandonment of temples in the central lowland. Around the 800s AD the Putun Mayas from the north had succeeded in developing a thriving Trading Network with its hub at Chactemal/Corozal connecting the Mayas of the north and northwest as far as the gulf coast, and in the south as far as Panama. Recent excavations have shown clay pots and other utensils from as far as the Inces in Peru. Also Christopher Colombus saw these big Maya boats in his voyages to America. It’s important to note here that this new powerful trading network by passed the central lowland and may be one of the factors contributing to their collapse. Another factor is its geographical position — between two rivers the Noh Ucum (Rio Hondo) and the Dzuluinicob (New River) and the majestic Bay. The fertile alluvial soils and raised farming facilitated a fast growing population engaged in intensive sustained agricultural production and porting fertilities in the bay for the trade in honey, salt, marine, products, cocoa etc. with goods from the highland Mayas. 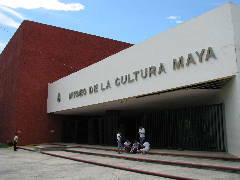 Maya cosmovision, as a last factor, supported a stable progressive society aligned toward growth and development. These factors primarily made Chactemal/Corozal a powerful and wealthy center and whose authority extended over a wide area called the Voymil province of southern Yucatan now Quintana Roo. Things were to change with the arrival of the Spanish. Two developing consequences of this unique powerful position are noteworthy. One Chactemal/Corozal became a target of Spanish greed and second it became a place of refuge, a sanctuary for Mayas escaping oppression and a place of resistance to Spanish rule. In 1511 two Spaniards, Gonzalo Guerrero and Geronimo de Aguilar make Chactemal/Corozal their home. Aguilar after 5 years and learning the Maya language decides to leave Chactemal and join Hernan Cortez. Gonzalo Guerrero earns the respect of Nachan Can the Maya chief of Chactemal. He becomes the NACOM and trains the Mayas to effectively fight the Spanish. Spanish attempts to subdue Chactemal/Corozal fail especially the one attempted by Alonzo Davila. Chactemal/Corozal subsequently becomes a center of resistance to Spanish rule. Gonzalo Guerrero marries Zazil Há, Nachan Can’s daughter and the birth of their children makes Corozal the cradle of the Mestizos in all of Spanish America. This situation inevitably made Chactemal/Corozal also a center of resistance to Spanish rule and alliances with other Maya groups Tipu, Bacalar, Lamanai to fight Spanish central happened frequently. Two events set the stage for the vulnerable role of the Chactemal/Corozal Mayas. The first the Spanish Conquest of the Itza Maya in Flores Peton and the British incursions in the northern coast line of Belize to cut logwood and mahogany. Both events decimated the population of Corozal with the Chactemal Maya forced to move into the forests of north western Belize. European epidemics also contributed to drastic population decline. Chactemal/Corozal position as a sanctuary is revised when thousands of Mayas and Yucatecos cross the Rio Hondo (Noh Ucum) back to their homeland in Chactemal/Corozal in 1848 as a result of the Caste War of Yucatan. Corozal today continues to be a haven welcoming thousands of people — the Jamaicans in the 1930’s, the Garifuna and Creoles etc and lately Central Americans escaping oppressive rule and wars in their countries. To conclude this part of the history of Corozal, history teaches us about our past to illuminate our present. We must develop a culture of respect a love of our Maya ancestry. I write you to find more creative ways of expressing this love and respect. Your pressure here is an inspection and together with this new Maya resurgence and empowerment, we will face the new challenge and opportunities of the New Maya Sun Baktun 13 and of this 21st Century. As we learnt from the Mayas and what they accomplished, we must act now if we are to make Chactemal/Corozal a place of opportunity where all of us especially our young people can look forward to a promising future. For much more about the Maya people of this area, be sure to visit the Maya Museum on Avenido Heroes, about a mile from the Chetumal Bay. Printed from https://chactemal.com — Maya History.